This chapter describes how to use the spring framework to integrate components that use Java interfaces into SOA composite applications. Oracle SOA Suite uses the spring framework functionality provided by the WebLogic Service Component Architecture (SCA) of Oracle WebLogic Server. This chapter also describes how to integrate components that use Java interfaces with components that use WSDL files in the same SOA composite application. It also describes using Java Architecture for XML Binding (JAXB) and the EclipseLink O/X-Mapper (OXM) to map Java classes to XML data. For more information about the WebLogic SCA functionality used by Oracle SOA Suite, see Developing WebLogic SCA Applications for Oracle WebLogic Server . For samples about how to use the spring framework, see the Oracle SOA Suite samples site. The spring framework is a lightweight container that makes it easy to use different types of services. Lightweight containers can accept any JavaBean, instead of specific types of components. WebLogic SCA enables you to use the spring framework to create Java applications using plain old Java objects (POJOs) and expose components as SCA services and references. In SCA terms, a WebLogic spring framework SCA application is a collection of POJOs plus a spring SCA context file that wires the classes with SCA services and references. As with all service components, spring components are defined in the composite.xml file. The spring component defined in the composite.xml file has service and reference elements with binding.java. Services are implemented by beans and are targeted in the spring context file. References are supplied by the runtime as implicit (or virtual) beans in the spring context file. You can also integrate Enterprise JavaBeans (EJB) with SOA composite applications through use of Java interfaces (with no requirement for SDO parameters). For information, see Integrating Enterprise JavaBeans with Composite Applications . You can integrate components using Java interfaces and WSDL files in a SOA composite application in the SOA Composite Editor. As an example, this integration enables a spring service component to invoke an Oracle BPEL Process Manager or an Oracle Mediator service component to invoke an EJB, and so on. If you drag a wire from a Java interface (for example, EJB service or spring service component) to a component that does not support Java interfaces (for example, Oracle Mediator, Oracle BPEL Process Manager, or others), a compatible WSDL is generated for the component interfaces. If you drag a wire from a WSDL interface to a component that does not support WSDL files (for example, a spring service component), a compatible Java interface is automatically generated. It is also possible to wire an existing WSDL interface to an existing Java interface. In this case, there is no checking of the compatibility between the WSDL and Java interfaces. You must ensure that it is correct. If you create a spring service component, you can automatically configure it with Java interface-based EJB service and reference binding components. No WSDL files are required. When wiring any two service components (or a service component with a binding component), each end of the wire has an interface defined. With XML, those interfaces must have the same WSDL definition, and are defined with interface.wsdl in the composite.xml file. From the JAX-WS point of view, when wiring a Java interface (which is defined by interface.java) to a WSDL interface, it is assumed that the two interfaces are compatible. This is typically enforced and automated by Oracle JDeveloper. Only use Oracle JDeveloper in Design view to create and modify the composite.xml and spring context files described in this section. Do not directly edit these files in Source view. These examples are provided to show you how Java interfaces and WSDL files are integrated in a SOA composite application. Use of Oracle JDeveloper to achieve this functionality is described in subsequent sections of this chapter. The composite.xml file for the spring framework lists the PortfolioService service and the StockQuote service with the interface.java definitions. The following example provides details. Oracle SOA Suite uses callbacks for both interface.wsdl and interface.java. However, the concept of callbacks does not exist in the spring framework. For Oracle SOA Suite services and references, a callback is specified (in the metadata) as a second port type for interface.wsdl or a second Java name for interface.java. The spring metadata has only sca:services and sca:references and no way to specify a callback. To design a callback with spring, you must provide sca:services and sca:references with a specific name. If you create both a sca:service and sca:reference using the naming conventions of someService and someServiceCallback, Oracle SOA Suite recognizes this convention and creates a single service or reference with a callback. In the SOA Composite Editor, if a spring interface.java with a callback interface is dragged to a WSDL component (for example, Oracle BPEL Process Manager, Oracle Mediator, or others), a WSDL with two port types is generated (technically, a wrapper WSDL, which is a WSDL that imports two other WSDLs, each having a single port type). If you drag a WSDL or Java interface that has a callback to a spring service component, a single interface is displayed in the SOA Composite Editor. However, inside the spring editor, you find both a sca:service and sca:reference that have the same naming conventions (someService and someServiceCallback). From the Components window, drag a Spring service component into the , as shown in Figure 55-1. Description of "Figure 55-1 Spring Context Service Component"
The Create Spring dialog is displayed. In the Name field, enter a name for the spring service component. The name becomes both the component name and the spring context file name. Figure 55-2 provides details. You can also select Use Existing Context and click Browse to select an existing spring file. For example, you may want to import a spring context that was created in Oracle JDeveloper, but outside of Oracle SOA Suite. If you browse and select a spring context from another project, it is copied to the SOA project. Description of "Figure 55-2 Create Spring Dialog"
A standalone spring version of WebLogic SCA is also available for use. This version is typically used outside of Oracle SOA Suite. This version is accessible by selecting Spring 2.5 JEE from the Components window while inside the spring editor. A spring icon is displayed in the SOA Composite Editor. If the contents are not automatically displayed, double-click the icon to display the contents of the spring context in the spring editor. From the Components window, select Weblogic SCA from the dropdown list. The list is refreshed to display the selections shown in Figure 55-3. Description of "Figure 55-3 WebLogic SCA Menu"
Drag a Service icon into the spring editor. The Insert Service dialog appears. Complete the fields shown in Table 55-1 to define the target bean and Java interface. Enter the target bean. This action enables you to expose the bean as a service. Note: Ensure that this target exists. There is no validation support that checks for the existence of this target. When complete, the Insert Service dialog looks as shown in Figure 55-4. Description of "Figure 55-4 Insert Service Dialog"
The target bean becomes the service interface in the spring context. If you close the spring editor and return to the SOA Composite Editor, you see that a handle has been added to the left side of the spring service component, as shown in Figure 55-5. Description of "Figure 55-5 Service Handle"
Return to the spring editor. Drag a Reference icon from the list shown in Figure 55-3 into the spring editor. The Insert Reference dialog is displayed. Complete the dialog, as shown in Table 55-2, and click OK. 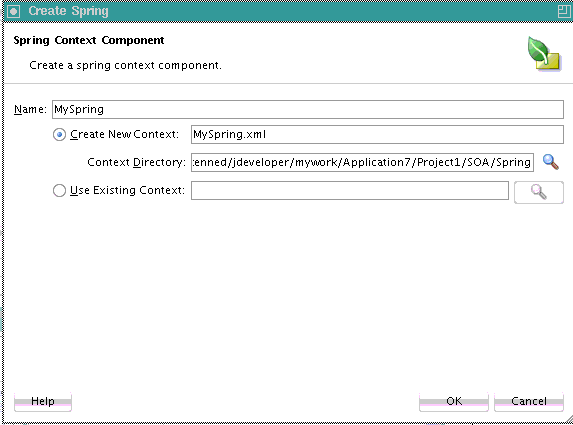 When complete, the spring context displays the service and reference in the spring editor. Close the spring context file, as shown in Figure 55-6. Description of "Figure 55-6 Spring Context File"
A handle is added to the right side of the spring service component, as shown in Figure 55-7. Description of "Figure 55-7 Reference Handle"
Drag the left handle into the Exposed Services swimlane to create a service binding component, as shown in Figure 55-8. Description of "Figure 55-8 Service Binding Component"
You are prompted to select to expose the service as either a web service or as an EJB service, as shown in Figure 55-9. Description of "Figure 55-9 Service Type To Create"
EJB: This exposes the EJB service through a Java interface; this selection does not require the use of a WSDL file. Web Service: This exposes the web service through a SOAP WSDL interface. If you select this option, a WSDL is generated from the Java Interface for compatibility with the spring service component. Select to expose this service as either an EJB or web service. A service is automatically created in the Exposed Services swimlane and wired to the spring service component (for this example, EJB is selected). Figure 55-10 provides details. Description of "Figure 55-10 EJB Service Binding Component Wired to the Spring Service Component"
Double-click the EJB service to display the automatically completed configuration, as shown in Figure 55-11. The configuration details were created from the values you entered in the Insert Service dialog in Step 7. Description of "Figure 55-11 EJB Service Dialog in Exposed Services Swimlane"
Replace the default JNDI name that was automatically generated with the name applicable to your environment. Drag the right handle of the spring service component into the External References swimlane to create a reference binding component. You are prompted with the same spring type option message as shown in Step 13. Select an option to expose this reference. A reference is automatically created in the External References swimlane and wired to the spring service component (for this example, EJB is selected). Figure 55-12 provides details. Description of "Figure 55-12 EJB Reference Binding Component Wired to the Spring Service Component"
Double-click the EJB reference to display the automatically completed configuration, as shown in Figure 55-13. The configuration details were created from the values you entered in the Insert Reference dialog in Step 11. Description of "Figure 55-13 EJB Reference Dialog in External References Swimlane"
Close the dialog and return to the SOA Composite Editor, as shown in Figure 55-14. Description of "Figure 55-14 Java Interface-Based EJB Service and Reference Binding Components"
Place the cursor over both the right handle of the service (as shown in Figure 55-15) and the left handle of the spring service component (as shown in Figure 55-16). The Java interface is displayed. Description of "Figure 55-15 Java Interface of Service"
Description of "Figure 55-16 Java Interface of Spring Service Component"
Perform the same action on the right handle of the spring service component and the left handle of the reference binding component to display its Java interface. Select Source view for the composite.xml file to display similar details. <!-- Generated by Oracle SOA Modeler version 12.1.3.0.0 at [5/16/14 3:05 AM]. If you wire the right handle of the spring service component to an XML-based component such as Oracle Mediator instead of the Java interface-based EJB reference, a Java interface is generated from the Oracle Mediator's existing WSDL interface. The following steps provide details. Drag the right handle of the spring service component to the Oracle Mediator, as shown in Figure 55-17. Description of "Figure 55-17 Integration of Spring Service Component and Oracle Mediator"
Click OK when prompted to acknowledge that a compatible interface was created from the Oracle Mediator WSDL file. Description of "Figure 55-18 Java File Creation from the Oracle Mediator WSDL File"
If you drag a wire between a Java interface and a WSDL-based component, and the WSDL file with the default name (based on the Java Interface name) already exists, you are prompted with four options. Click Cancel to cancel creation of the wire. Figure 55-19 provides details. Description of "Figure 55-19 Existing WSDL File"
Place the cursor over both the right handle of the spring service component (as shown in Figure 55-20) and the left handle of the Oracle Mediator (as shown in Figure 55-21) to display the compatible interface. Description of "Figure 55-20 Spring Service Component Interface"
Description of "Figure 55-21 Oracle Mediator Interface"
Double-click the spring service component to display the contents of the spring context file in the spring editor. When integrating a component that uses a Java interface with a component that uses a WSDL file in the SOA Composite Editor, if a specific interface class is not found in the classpath (including the JAR files in the SCA-INF/lib directory), but the source file does exist in the SOA project, you are prompted to automatically compile the source. You can also create BPEL process partner links with services that use Java interfaces. You select this type of service in the Service Explorer dialog when creating a partner link. For more information, see Introduction to Partner Links. When a Java-to-WSDL conversion fails because of a bad Java class and you modify the Java code to correct the problem, you must restart Oracle JDeveloper. Not doing so results in a Java-to-WSDL conversion failure because the new class is not reloaded. You can define custom spring beans through a global spring context definition. This configuration enables you to define these beans only once, at the global level. Add the corresponding classes in either the lib directory (as a JAR file) or the classes directory (as extracted files of the JAR file). A server restart is required to pick up newly added spring beans. headerHelperBean: For getting and setting header properties. The instance ID of the flow instance currently running. The instance ID of the component instance currently running. The composite distinguished name (DN) containing the component. The name of the spring service component. loggerBean: For providing context-aware logging messages. The predefined spring beans are automatically injected into the spring service component. However, you must explicitly integrate the predefined spring beans into a SOA composite application by providing a reference to the bean in the spring context file. For an example of how to reference loggerBean and headerHelperBean in a spring context file, see How to Reference Predefined Spring Beans in the Spring Context File. * Interface for getting and setting header properties. You create references to the predefined beans in the spring context file. Open the spring context file in Source view in Oracle JDeveloper. Add references to the loggerBean and headerHelperBean predefined beans. You can also map Java classes to XML data when integrating an EJB with SOA composite applications. For more information, see Integrating Enterprise JavaBeans with Composite Applications . The external JAXB annotations can be specified either directly in the EXM file or included in the separate TopLink JAXB mapping OXM file that can be referred to from the EXM file. The EXM file name must match the Java class name and reside in the same package location. For example, if the Java class is named pack1.pack2.myJavaInterface.class, the EXM file must be named pack1/pack2/myJavaInterface.exm. Oracle SOA Suite design time supports placing the EXM file in either the source path (SCA-INF/src) or the class path (SCA-INF/classes or a JAR in SCA-INF/lib). Placing the EXM file in the source path (SCA-INF/src) enables you to edit the EXM using Oracle JDeveloper (files in the class path do not appear in the Applications window in Oracle JDeveloper). When project compilation is complete, the EXM file (and any XML files that it imports) is copied to the class path (SCA-INF/classes) for deployment. If the EXM file is in the source path, it must still be in the same corresponding directory structure. If you place the EXM (and OXM) files in SCA-INF/src, ensure that your Oracle JDeveloper project is configured so that SCA-INF/src is the default source directory (right-click the project name, and select Project Properties > Java Source Paths). EXM files can also be found in JAR files that are in the project's class path. When you drag and drop a Java interface (Enterprise JavaBeans) to a BPEL process, Oracle SOA Suite checks to see if the EXM file exists. If it does, it is passed to the web services java2wsdl API. Constructs that are analogous to JAX-WS or JSR-181 that override or define attributes on the service endpoint interface (SEI) and JAXB annotations for the value types used in the interfaces of the SEI. Additional mapping specifications not available using standard JAX-WS or JAXB annotations, primarily for use with the java.util.Collections API. References to external JAXB mapping metadata from a Toplink OXM file. Using a relative file path is not possible because the SCA package is not treated as a regular JAR file for the class loader. For example, the following classpath protocol indicates to find the Groovy file from the class path. Add Groovy and Aspectj files in any of the following directories when using the classpath protocol. No other directories are possible. If your build scripts are configured to clean the classes directory, either put the Groovy files in the SCA-INF/lib directory or design your build scripts to prevent cleaning. Add spring extension JAR file libraries for Groovy or Aspectj to the class path of the managed server's setDomainENV.sh or setDomainENV.bat file and restart the server. This ensures that deployment is successful. The restart is required because spring uses Java reflection to instantiate aspect-oriented programming (AOP). The use of reflection restricts the search for classes to the system class loader. Any changes to the system class loader require a server restart. This section describes how to troubleshoot errors with the spring service component. Ensure that you deploy the JAR file containing the class into the SCA-INF/lib directory or the classes into the SCA-INF/classes directory of the SAR file. The Oracle SOA Suite Quick Start installation automatically includes the spring extension files for invoking the spring editor. This enables you to successfully add a spring service component in the SOA Composite Editor and invoke the Create Spring dialog, as described in How to Create a Spring Service Component in . 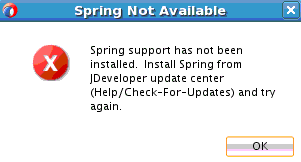 If you use the standard Oracle JDeveloper installation outside of Oracle SOA Suite, you must install the spring editor by selecting Check for Updates from the Help main menu in Oracle JDeveloper, then selecting the spring extension files in the Update Center. Otherwise, you cannot successfully add a spring service component into the SOA Composite Editor and invoke the Create Spring dialog. Instead, you receive the error shown in Figure 55-22. Description of "Figure 55-22 Spring Unavailability Error"